What is your workout schedule? What do your meals look like? How did you lose weight and stretch marks after pregnancy? These are just a few of the questions you sent in last week. Hello, everyone! It’s Carrie Sisson here today to field your questions. 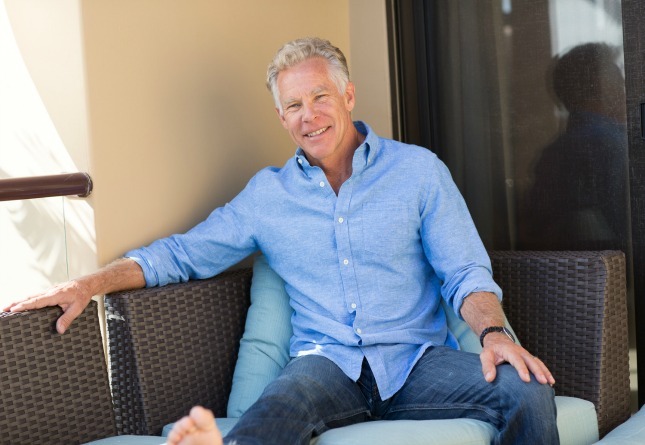 Last week Mark and I asked for any questions you might have about my experience living the Primal lifestyle. I want to thank everyone who commented for your kind words and thoughtful questions. I’d love to hear your thoughts to my responses in the comment board today. Thanks again and Grok on! What kind of workouts do you do? I love to be outdoors, hiking or sprinting on the beach. I work out in the gym with a personal trainer (a bodybuilder who won the Miss California title) to maintain my muscle tone and strength. I also do some yoga, because I love the way I feel after a class: a state of blissful inner peace that helps the rest of my day flow with ease and grace. Weekly routine? What kind of weight training do you do? How long and how often? How long have you been exercising? I’ve been pretty active all my life. I played tennis, skied and water skied growing up. I jogged (maybe 10-15 miles a week) during the jogging craze. I have lifted weights since my late twenties (in fact, I met Mark in a gym in Los Angeles in 1987). I have to say that since we really started focusing on “Primal” living, I feel better and am stronger than at any other time in my life. Do you do anything specifically for your abs? No, I have learned that most compound exercises work the abs better than all those ab-specific exercises (and you don’t really have to think about it). The abs respond more to activities that require stabilization more than they do to just crunching. How many carbs do you eat on a daily basis? I try to stay at right around 100. I rarely exceed that amount by very much and often fall below it. Is your diet rich in fats? Yes, I love cheese, butter, full-fat yogurt, salad dressings made with extra virgin olive oil, nuts, seeds, avocado, fatty fish, etc. Why have you chosen to exclude red meat and poultry from your diet? My parents became vegetarian over 30 years ago and inundated me with the many books on the inhumane treatment of CAFO animals. I guess it sank in, because I haven’t eaten red meat or chicken since. About ten years ago, I did notice that it was difficult to get a reliable source of good protein, so I began eating fish. I now eat some form of fish every day, along with the use of supplemental protein (powders). The increased protein really boosts my energy. How many calories do you take in for maintenance? For weight loss? My weight never varies more than five pounds, so I don’t really count calories. I eat when I’m hungry and eliminate simple carbs most of the time. Like Mark, I can have days where I eat a fair amount (maybe 2,300 calories) and others where I can eat next to nothing and suffer no ill effects. How sensitive for carbohydrates are you really? I still have a sweet tooth. I think we all do, but I don’t get carried away indulging it. If I have dessert at all, it might be a taste or two at a restaurant or as a guest at someone’s house. Also, I never really appreciated how impactful grains are on my body. I do try to avoid them now. If I break down and eat grains (and I do every great once in a while – but not that much) I bloat, have gas and get a “poochy” belly. Clearly, women need fewer calories than men overall because they tend to have less lean mass. I think it’s the hormones that helps drive the allocation of fat on women’s bodies, too. So a diet high in carbs will tend to see an even greater impact on fat storage in women. Meanwhile, I think women just need more dietary fat than most get; sometimes as a result of childbearing and nursing, other times as a result of monthly hormonal changes, etc. Women always tend to be afraid of dietary fat (and I certainly was), but I have seen that the more fat in my diet (as long as the carbs are low) the healthier I feel and the better I look. Some friends and I were just discussing how lifestyle can affect women as they get to that stage in life where every doctor is handing out hormones. Any thoughts on this? I am going through menopause now. I tried for a long time to do whatever I could naturally to avoid hormone replacement therapy; I tried all the herbs, black cohosh, dong Quai, Evening Primrose, macca, specific vitamin regimens, etc. The hot flashes were bearable, but when my memory started to go, I gave in. I now use bio-identical hormones in a cream form (low doses of progesterone, estrogen and testosterone) and have never felt better. How to lose weight/stretch marks after pregnancy? I breastfed my daughter Devyn for two years (and son Kyle for 16 months). In each case, I had my body back – or even leaner – within two months and never had stretch marks. It could be because I never gained much weight with either child. It could also be the amount of fat in my diet, the fact that I rubbed coconut oil on my belly each night or because I exercised through each pregnancy. I would say it was partly genes, but my own mother had serious stretch marks from each of her children. Maybe it’s just luck, too. What effect has living Primally had on your reproductive health? Easier periods, etc? I used to (and sometimes still do) suffer from very painful periods and I notice that when I’m strictly off grains/refined sugars, they are less so. Do you have any observations about this? I figure if living primally is good for overall health, it has to have a positive effect on a female’s reproductive health as well. I was not eating truly Primally until just before menopause. However, I have friends who have cut out the sugar and the grains and who no longer have menstrual cramps, their periods are lighter and they have more energy during their cycle. All the research I have read confirms that a high-fat, low-carb diet will offer those benefits. It’s just getting through the transition that is the hardest part. What do you feed your children? Did you exclude all grains from your children’s diets? I wish I had had this info when my kids were younger. They grew up on “healthy whole grains.” Of course, they have cut way back now. My 18-year-old daughter is healthier and leaner for having done so. She eats all forms of meat, poultry, eggs and fish as her main emphasis. My 15-year-old son is still a vegetarian (his choice from age two) and has opted to cut back on grains somewhat, while increasing his salads, steamed veggies, nuts and fruits. He loves avocados, heavy whipping cream and olive oil and he does get added protein from yogurt, protein powders and some legumes. As a mom of two small children I’m both struggling to get back to an athletic life (and lose the baby weight) and I’m trying to figure out how to get the kids to enjoy primal foods. I’ve resorted to letting them at least keep their oatmeal breakfast to get them to eat. Any thoughts and suggestions to a young family would be very welcome! I make sure we have plenty of Primal food choices in the fridge or the pantry at all times. I also got rid of most of the non-Primal snacks, so there’s no temptation to go for a bowl of Rice Crispies instead of an apple with almond butter. We try lots of recipes until we find some that everyone enjoys. I still take my son grocery shopping with me and he likes helping plan dinners together. My question is more for my kids. Do you have any tips for packing them good “primal friendly” lunches for school? My daughter liked to roll turkey and cheese into little finger sandwiches (instead of bread) as her favorite lunch. I also used to give them small containers of fresh berries or celery with cream cheese or I’d cut up red bell peppers, carrots, and/or cucumbers with a home-made dipping sauce. Mark says a cold chicken leg is a great lunch meal, too. Any advice you have to balancing role of mom in the quest for health? I enjoyed rollerblading or jogging with my kids in a “baby-jogger” for years. As they got older, we played many games with them at least once a week outside. Soccer, tennis, biking, hiking, Frisbee, swimming at the beach, ping pong, stand-up paddling, you name it. I think kids are the best excuse for parents to get back into the mindset of the Primal law that says “Play.” Of course, it gets the kids into that mindset, too, because sometimes kids today spend way too much time inside. I also think it’s imperative that you model good eating patterns for them. Let them get involved cooking with you or food shopping or meal planning. How long have you been Primal? For me it has been a gradual transition. I have always valued sleep and play. Those were easy for me. I have worked out religiously since my mid-twenties – although I bought into the cardio thing for too long. I recently became a fan of sprinting, even though I was pretty good at it (=fast) for most of my life. I have always done the kind of gym workouts that focused on body parts, but within the past five years have transitioned to more full-body motions (pushups, pull-ups, dips, weighted squats and lunges, etc). The diet was more recent. I only gave up wheat three years ago. The effect was so pronounced (in a good way) that I gave up oats and other grains shortly thereafter. Now, I might eat some rice in a sushi roll or a tortilla chip here and there, but usually that’s only when we go out to eat (because I simply don’t keep those things at home). What do you do to take care of your skin? It looks like you have very few freckles, wrinkles, or age spots (or stretch marks!!) despite living the “Malibu lifestyle” with lots of sun. I do live the Malibu lifestyle and spend a good deal of time in the sun, but I am adamant about keeping my face, chest and arms covered with clothing, shade or a good combo UVA/UVB sunscreen. That way, I get my tan and my vitamin D, but minimize the ageing part. I also do take advantage of twenty-first century medicine in that I do micro-dermabrasion on my face and neck and get glycolic acid peels once in a while. I am very interested in the primal female perspective and how it might differ, even if only slightly, from the males. I have spent the past few years studying spiritual psychology and noting the energetic differences between men and women (and how to coexist peacefully with those differences!). I love the Primal concept and think Mark has really hit on a novel way of viewing how we evolved physically. I do believe we (men and women) are different energetically and can each take the Ten Blueprint Laws and apply them in our own unique way. For example, I like the idea of going barefoot a lot, and I do so around the house and on the beach, but you won’t catch me wearing FiveFingers to the gym anytime soon. And there’s no way I’m ever giving up my Manolo Blahniks. yay Carrie, thanks so much for your replies! I hope we’ll be seeing more of you in MDA and there will be more Dear Carrie posts. I so enjoyed reading your post! I am 25 weeks pregnant with my second son and am sticking to a Primal type eating and exercise routine. I had a great delivery the first timie around, but I hope my reduction in grains and crabs and increase in Omega-3s make this delivery even easier. I will be an avid reader of your posts! OOPS – I meant carbs. Hee hee. fantastic post! i’ve been reading the blog for over a year, but was actually carrie’s picture that inspired me to buy the book and give up grains. Nice to meet you through MDA! Are you concerned about mercury poisoning by eating fish every day? I read in an article recenty that the actor Jeremy Piven got mercury poison from regularly eating sushi (sometimes twice a day). I try to eat wild caught salmon at least once a week (and sometimes more) but would be concerned about eating fish every day. Dave, I almost never eat tuna. I eat salmon the most, then I mix it up with shrimp, halibut, swordfish, trout, etc. Hi Carrie:Isn’t swordfish supposed to be one of the worst fish for containing mercury? Thanks for taking time to answer our questions! Thank you sooo much for the detailed responses. Wonderful to hear a woman’s perspective. By the way I totally agree with you on the menstrual cramps. I’ve had terrible, debilitating cramps since the age of 14 (nothing ever medically wrong). I’ve been primal for a few months and had my *first* pain-free period at the age of 40 last month. Wow! I concur. That is one of the first and most impactful things I’ve encountered since going primal. The cramps have disappeared. I suffered severe (like take an entire day off of work/so sick severe)menstrual cramping and pain from age 12 to about 2 months ago as well. I went primal towards the end of July and have been shocked at the relief. I’ve only lost about 5 pounds and 1.5 “dress size’s” total, but I will never go back if it means reverting back to the pain. Thanks Mark and Carrie! You have no idea how happy your post just made me. I’ve just “gone primal” within the last month and am, as I write this, suffering through what I hope is one of the last excruciating periods. What a wonderful glimmer of hope you’ve provided – thanks! OMG, Carrie! Haven’t you heard that heavy weightlifting makes women bulky, grotesque and prone to spontaneous baby oil applications??? You’re a ticking time bomb! WHEW! Thank God! If you didn’t warn her, I was gonna have to! totally just testing this gravatar thing…..
what is the “heavy cream” that you have with green tea. I’ve been looking for a decent type of creamer for my tea to no avail. another alternative is raw, pasture-fed heavy cream. So much yummy vitamin K2!! Thanks for all the womanly insight! With 2 youngsters at home we are really trying to get them involved in the food prep- helping harvest at farms, canning, baking and meal planning. We are Crossfitters and hope to get the kids on a Crossfit kids program soon too. One thing we do with the kids is sign them up for local kids fun runs- they usually get a medal for participating and have so much fun doing it. Our 7 and 4 year old both just finished a 3/4mile run last week! Setting a good example by having them watch us workout is key too- especially for my 4 year old daughter- seeing mom workout really sets that foundation for her that women are STRONG too!! I’m a bit worried about how I might handle pregnancy if/when I get to that stage of my life. I’m fairly certain that I could eat Primally during a pregnancy without problems, but I’m also fairly certain that my mother (who is, in some areas, still held in the throes of CW) will freak out and insist that I need to eat a bunch of extra carbohydrates (via hypersugary fruit and other things I have no intention of eating). I’ve had 3 healthy pregnancies with minimal doctor’s care. I tend to listen to ‘old folk advice’ and the one thing that was stressed to me was, ‘Gal, don’t eat too much of de starches an’ you gon’ be ok’. Geri, it’s easier if you have already had a few months eating Primally before getting pregnant. Even if you don’t go “full Primal” you can certainly cut the grains and sugars and be doing you and your baby a huge favor. Nobody needs a “ton” of carbs. the carbs/menstruation link is so very strong! i binged on carbs this past weekend for the first time in months and i’m having the worst cramps i’ve had in….months. coincidence? i think not. carrie, this was awesome to read! i hope to see much more of you here! Dear Carrie, thank you for taking the time to reply to all our questions. I hope I’m atleast half as fit as you when I’m your age. I hope we have more such posts from you. Let’s get a Primal gathering in Santa Barbara, Malibu, or Santa Monica; Los Angeles just does not seem like it fits the primal lifestyle (sorry). I think it would be terrific to meet Mark, Carrie, and the other fellow PBers in the area. Consider it a social party with primal food and games of ultimate frisbee and beach sprints. Anyone care to bring their mace? Or in Culver City! Don’t knock LA and surrounding environs. There are lots of great primal things to do here. Santa Barbara would be a bit far for me, but I think the LA area (including Malibu, Santa Monica, Manhattan beach, Culver City, etc.) needs a primal gathering. i am super glad you answered these questions, thank you so much! i am 26 and because of lifestyle and and lot of psychological stress i suffered in my early years i am pretty hormonally deficient. i do, however take DHEA to help my body produce its own and am wondering if you have looked into it as opposed to hormone replacement therapy. also the role of cholesterol(horray red meat!) in producing hormones. just a few thoughts! DHEA is a hormone, a form of androsterone/testosterone. Using DHEA is a form of hormone therapy. Carrie, it’s so generous of you to share some of your everyday routines with all of us. I’m 46, began lifting weights and eating healthy in college and now people think I am 35 and sometimes younger. It’s not all about looking younger of course, feeling good and energetic everyday is also great. Look forward to future posts from you! btw Joel, I recently found a creamer made from coconut milk at my health food co-op. Regular and vanilla flavor, not too bad in carbs and very tasty! I’m sorry I can’t remember the brand name but I can get if you want. You probably already know this, but you may want to make sure your Horizon organic whipping cream isn’t ULTRA-pasteurized. If so, check out the date, usually 2 months out. It has a super long shelf-life and doesn’t even need to be refrigerated, that’s how highly heated/processed (and dead) it is. Raw cream is my favorite, but otherwise, I’ll use non-organic to avoid ultra-pasteurization. I second Kelly’s advice. The Whole Foods in the LA area carries raw cream which is absolutely delicious in coffee, or on fruit, or on its own. It’s sold in squat glass bottles (forgot the brand name). I believe all of the Horizon’s organic milk products (including cream) are ultra-pasteurized and homogenized. Raw cream is about $12/pint in Ojai. How are we to get good dairies that sell sell real milk and cheese for fair prices? The providers are shut down. Here we use an illegal system. All I can say is you are doing something right because you both look like the picture of health. Thanks for taking the time to do this, Carrie! You’re truly an inspiration. Carrie, you look amazing! I started going Primal during the Primal Challenge, and while I’m not perfect in my food choices, I’ve severely limited my grains and carbs. My cravings have diminished significantly – vanished, almost! – and I’m feeling better than ever. You’re definitely an inspiration to all of us women, no matter what age we are! Thank you again for the feedback. I was a little disappointed about what you wrote about the stretch marks. Not because you never got them (lol), but because it sounds like there is no hope in getting my cute tummy back-so sad. I am lucky in that I did not get really deep marks and I only got a few, but from losing weight and gaining and losing (CW dieting)-I have even more. I was hoping that there was more hope for them…oh well. Life goes on. I have been doing a lot more hiking lately with my kids and really enjoy the entire aspect of it– being outdoors, getting plenty of fresh air and exercise, learning about the environment and mostly the playing. Once a week is a prescription to happiness. I think Carrie should be a regular contributor! Carrie– I’ve a question. Since you are going through menopause, do you find that your body is changing and that it’s more difficult to keep the weight off? Are you finding certain areas on your body more troublesome than others? Ecala, my weight did not change during peri menopause or menopause until I starting using the HRT or Hormone Cream. That caused me to gain a few extra pounds around my abs and hips. It took my body about 6 weeks to normalize back to the weight and body fat % I prefer. I was very conscious about my simple carb intake during that time period. There isn’t a food on this planet that tastes good enough to temp me away from the feeling I know I’ll get when I put on a little black dress or pair of jeans and FEEL GREAT! What a beautiful philosophy. I have so often given in to terrible food cravings even though I knew it wasn’t helping my body look or feel good. It’s nice to hear your perspective. Thanks! Thanks Carrie. I’m going to have my lady take a look at this. Great post! & good nutritional breakdown. Thanks for this, you look amazing. Just one question, what type of protein do you use, whey? Carrie’s a great role model for what is possible regarding staying fit and healthy. Thanks so much for this post. It was great hearing a woman’s perspective and the daily breakdown was a great illustration for me as I am trying to phase out grains in my diet. Thanks for all the great responses to these questions. 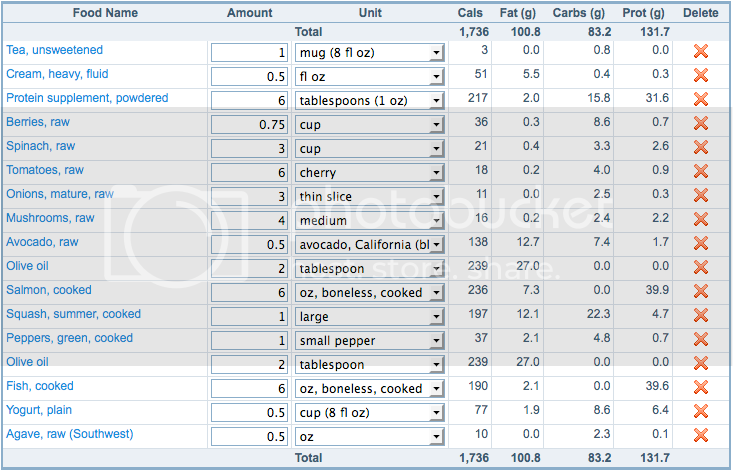 what did you use to track your calories / food eaten? Was is a website? Thanks for taking the time to share with us, Carrie! Yeah, don’t be a stranger now 😀 We’d love to see more of you here. Since I don’t love green tea it makes it more palatable. However, I read that the dairy erases all the benefits of the green tea (I forget the exact science). Have you heard this as well? I’ve understood that as well– that cream negates the benefits of the EGCG in green tea. It’s great to hear about the primal lifestyle from a woman’s point of view! I’m so glad I’m not the only one who won’t give up ridiculously high heels just because I eat primally! I’m wondering about your dairy consumption. In the sample meal plans, you have yogurt, heavy cream, and cheese (although not all in the same day). As far as I know, MDA hasn’t really made a stand either way on dairy, so I was wondering what your thoughts were. P.S. You look great! Talk about inspiration to keep eating and working out this way! Thanks for sharing, Carrie, it’s been very helpful to hear your perspective. I hope to hear more! Two questions — you write that you tend to eat a lot of fish — particularly for dinner. I know Mark eats quite a bit of meat. Does that mean you two are preparing/eating different primal meals for dinner? 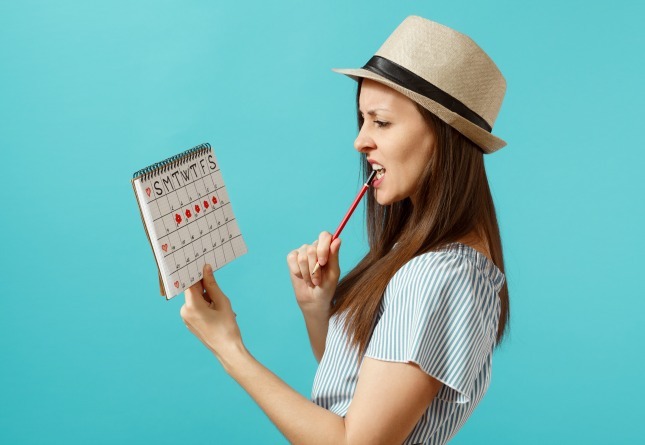 I second the question — what program were you using to track calories and macronutrients? Calorieking? An iphone app? Website? Do tell..
Josh, we use fitday.com to track everything here. Hi. Are the Fitday numbers incorrect, are do you have lowfat yogurt, rather than whole-fat yogurt? Thanks so much for this post! I have just discovered this site and bought the book this weekend but I don’t eat much chicken and only very occasional red meat. I figured fish and some whey protein are my path and then I found this post. This blueprint has found me with perfect timing (when the student is ready…) Anyway, would love to hear more. It’s always a little harder from the female perspective to unbend our minds about fat so this was very helpful. You both are a great inspiration. Many thanks! This is the welcome page for the dietguidance.us Association web site. love the pictures of you and mark! you make one beautiful, inspiring couple. My husband found this post and sent it to me. I am 46, in the midst of peri-menpause, with heavy periods due to fibroids, and adenomyosis(sp?). All my girlfriends are going to hormonal replacement therapy, or they are getting hysterectomies. I want to do this as naturally as possible. Where do you find the creams that you are using? I have been primal for 2 1/2 months, but find myself craving chocolate when I am ovulating. Will this ever go away the longer I am primal? This is where I fall off the wagon. Carrie, I think you should write a book for women, that addresses women, because we are so different from our male counterparts. Thank you for your breakdowns of exercise and diet. I love yoga, but was wondering how that fit into the Primal BP. Now I know. I love doing pull-ups, dips, pushups, but there is definitely something about doing a bench press, and a military press that I love. Finally, are you going to be at the conference in April? I am looking forward to meeting Mark, but I would love to meet you, as well. You both are inspirations and I am so grateful to have stumbled upon Mark’s book. In response to Michelle: I am 42 and had really struggled over the past few years with extremely heavy periods, and out-of-whack hormones in general. In Jan. of 2010 my estradiol levels were so low they were near post-menopausal! In August I started ProHelp progesterone cream 1-800-daystar/ helpful link (askdrbarbara.com). I think I’m correct in telling you Dr. Barbara Hoffman is the one who formulated this cream and IT WORKS! … Anyhow, I can’t say enough good about it. Perimenopausal and menopausal women can use it, as well as teens 14 and above. I noticed a difference immediately and in just 2-3 months my estradiol levels improved greatly. I’m excited to share it with you! HI there, I really enjoyed Carrie’s section as I am a woman. I have only been primal for 2 weeks now and really enjoyed hearing Carrie’s comments. And I realize, after reading about the connection between carbs and cramps, that my period has just passed and has been the easiest one I can recall. No cramps, no headaches, I *barely* noticed it! I wouldn’t have even thought it would be cutting out refined sugars and grains, but it is a complete 180 difference to last month. Carrie, are you on the same page with hormone replacement now? I have been seven years without hormones (postmenopausal) now, on Atkins first, now Primal, and feel great. Do I really need somebody else’s hormones (through a patch or pill)? Carrie, you look amazing and are such an inspiration! Thanks so much for the good info. Note: Dr. Mercola sells the best Miracle Whey Protein AND sells dark chocolate bars high in protein (with whey) and NO sugar! Check it out! What a beautifully open post. Thank you Carrie! Will you ever come for a visit to new-zealand? There are plenty of primal followers here! And great skiing area’s like mount hutt lol! Been Primal for one week and my heart continues to race. Is this because of the lack of glucose circulating in my blood stream. I do not need to lose weight. I would like to feel better and have more nergy. Carrie, thank you so much for your posts. I am newer to the site, but am loving the information,a nd passing it along to my wife to help us both become healthier people. I wanted to ask about your response to teh question of makign periods easier and less painful. You said something about all yoru research shows lowering carbs and keeping fats high will help, and I wanted to know if you could provide some links to some of that research so that I may show it to my wife. She has VERY painful and erratic cycles, and we are trying nearly everythign under teh sun to help “normalize” her and reduce pain/stress levels. Carrie, thank you for posting this! It was great to see the ratios of fat/carbs/protein you actually eat. I’m an almost-40-year-old woman with quite a bit of fat left to lose (I’ve already lost 60 pounds, but I’d like to drop three more pants sizes). I’m having a really hard time getting past the decades-old “eating fat will make you fat” mindset, even though I can see why we’re actually healthier when eating fat. I guess my question is, for a woman who has about three sizes’ worth of body fat to lose, is it still advisable to eat around 50% of our calories as fat? Also, everyone says that primal eating will naturally curb the amount of calories you consume, but do we really not need to worry about calories when eating/living primal? I guess I see the logic of it, but in spite of that, there’s a big part of me that’s scared to take the leap and start gaining again! I too have worked out most of my adult life and have adopted Mark’s diet for the most part. I have currently added the P90X workout routine to my schedule. It is a demanding workout but I am managing it well. My question is this. They are encouraging carbs from grains, starches, etc. for additional stored energy when needed. Can you give me your opinion on this? Thanks. So late to comment… but I actually have more severe menstrual cramps after going primal. My period disappeared for the first 3 months and when I got it back, the pain was just terrible. I hope that doesn’t discourage others.. It was much shorter and lighter, just more painful. You mention your “memory started to go”, what types of things started to happen? (I am in this stage and just trying to keep up with any bizarre symptoms, so far I’ve not had any.) Thanks so much for your healthy incite. 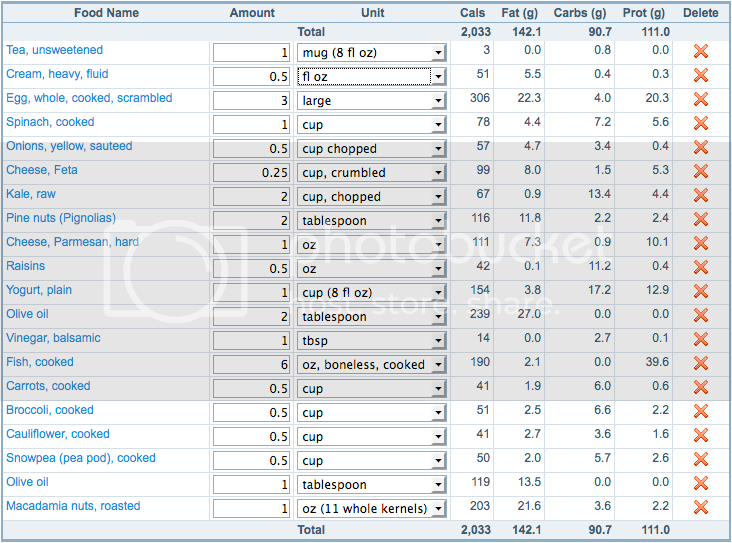 Hi Carrie – which website or app did you use in the images above of the nutritional breakdown of your sample meals? Thanks so much! How long have you and Mark been married? And while on this path for continually growth and betterment of oneself physically, what are the keys to your success in a committed, long-lasting marriage? Thank you for all the female insight. I’vet been KETO for 3 months. I lost 19lbs & I don’t know how many pants sizes. Anyway, I was struggling with leg cramps, low energy & feelings of weakness. So, I added a little more salt to my diet along with almonds which I love. The leg cramps have pretty much subsided but, the low energy & feelings of weakness have continued to the point I’ve considered giving up being KETO. I use to be a slave to the gym & loved to run, but, I just can’t muster energy or will to do any of it. Do you have any suggestions? Thanks ahead of time I really look forward to your reply.